Whether you're going cross country or across town Carlisle Sport Trail is built tough to handle all your trailer needs. Innovative and superior tread design for today's towing demands. These tires have a multitude of uses, including log-splitters, snow mobile trailers, boat trailers, utility trailers and campers. Great tire. It held overloaded when others blew out. Tires are on travel trailer. Will begin to take cross country trips this summer. this tire is for my boat trailer wtich I drive twice a year. 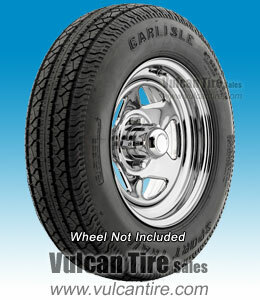 Vulcan Tires has great prices. These tires are great, and they were priced very low. When we actually got the order we had actually got one tire that was the wrong size. Vulcan tires, didnt waste time, we got the right size tire within a few days!! very pleased!